A big part of the fun of shooting 3-gun is getting to shoot…all three guns. Shotguns, rifles, and pistols all get to play in 3-gun, and a significant part of the game is making sure you have the right guns to succeed. We’ve already talked about the shotgun and rifle parts, so now it’s time to get to pistols. We’ll go over what rules govern your pistol selection for 3-gun competition, talk about a few must-have features, and discuss some recommended pistols. 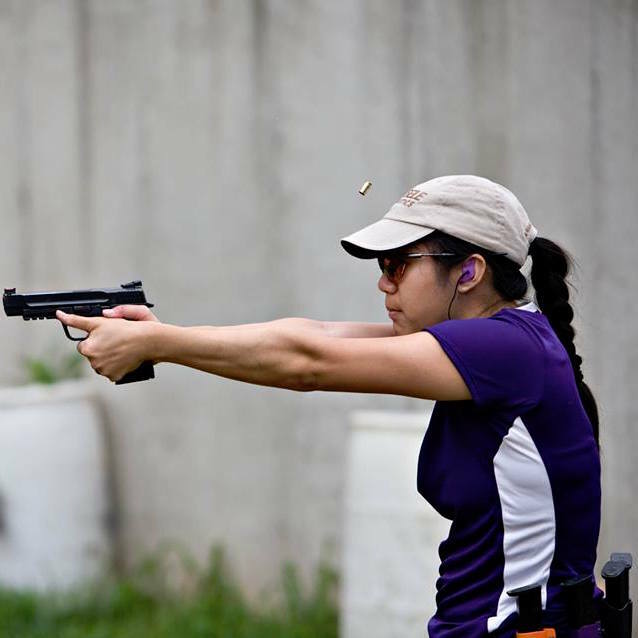 Many people getting into 3-gun already own a pistol, perhaps from one of the handgun-focused shooting sports they tried before the siren song of 3-gun caught their attention. Whether it’s a gun set up for IDPA or USPSA, or just a pistol you carry or have in the safe, it’s probably at least a good start for 3-gun. Under most of the common rule sets, there are few limitations when it comes to how you can set up your pistol for 3-gun. Generally, what you can’t do will be related to optics, lights, or lasers, but the sky’s the limit otherwise on the gun itself. Magazines are a different story, and are commonly limited by how long they can be rather than specifying a certain number of rounds you can have in them. Keep in mind that you’ll want to be able to carry quite a bit of pistol ammunition with you on a stage, as base round counts can be high. The author’s personal 3-gun pistol, a SIG Sauer P320 with Springer Precision magazine well and extensions. You’ll need even more if you decide to engage optional targets with a pistol instead of one of your other guns or have trouble with the very small or distant targets that might be out there. You might get 5-6 inch circles, or targets out at a hundred yards or more, and have just enough to toss one or two rounds at each might be a mistake. So with these rather broad requirements, what should you look for in your 3-gun pistol? It might seem obvious, but it should be said: a semiautomatic pistol is the best choice for 3-gun, and a double-stack gun is a better choice than a single-stack gun. You need the capacity and the ease of reloading on the clock. From there, start with caliber: the best choice for 3-gun is 9mm. It’s generally the smallest caliber allowed and you don’t need more unless you are shooting a division that requires it (basically just Heavy Metal or its equivalent). By choosing 9mm, you get the advantage of minimal recoil and the ability to stuff more rounds into your magazines. Speaking of magazines, it’s a good idea to have extended magazines up to the limit allowed under the rules you’re shooting under. That means either factory magazines available from the manufacturer that are longer than standard, or special basepads that attach to the bottom of your magazine to allow for greater capacity. These Taran Tactical Firepower Base Pads are an excellent start, and have an impressive competition pedigree. 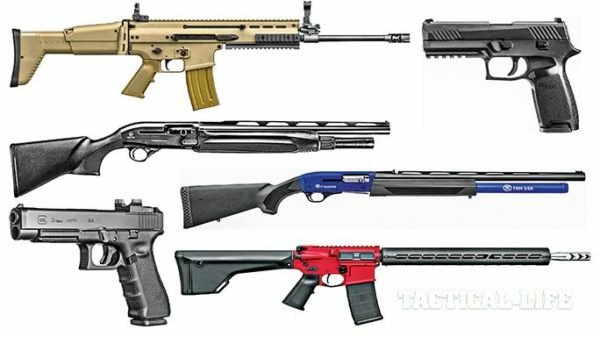 You’ll likely want some of the basic work that is normally performed on many competition guns: new sights, perhaps an improved trigger, and maybe some stippling or new grips. They’ll make it easier for you to hang on to your gun in challenging conditions and to hit your targets. It can also be helpful to have a magazine well, or magwell, on the gun. A magwell, is a flared, funnel-shaped attachment for your grip. It not only makes it easier to recover from a fumbled reload, it can add weight to the pistol to reduce recoil. The Dawson ICE Magwell ($80) makes a smooth funnel to guide magazines into the gun. With all of these features that are a good idea in a 3-gun pistol, it’s important to find a gun that either has them up front or has good aftermarket options to add them later on. Certain accessories aren’t available for every type of gun out there, and you don’t want to make necessary upgrades difficult right off the bat. So knowing all that, what pistol should you buy for 3-gunning? There are two major directions to go with a 3-gun pistol: a custom 2011 or some form of a striker-fired gun. 2011s are essentially a wide-body or double-stack 1911. They are single-action guns that are largely found in competition these days (though there are exceptions). Shooters like them because they are heavy, which is great for reducing recoil, and they have light single-action triggers that are easy to shoot well. 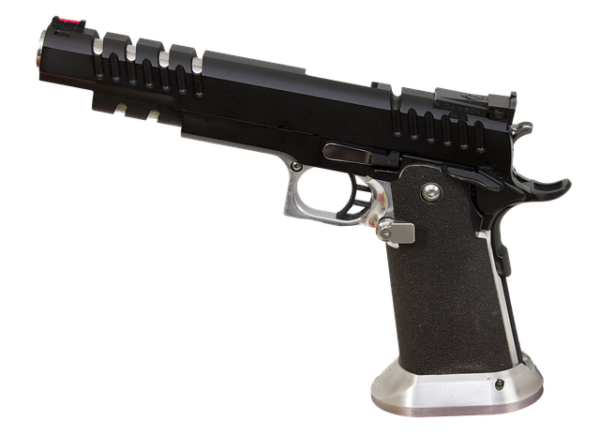 While there are “off the shelf” versions available like the STI DVC 3-Gun below, most are hand-built by small shops and can be made to your specifications. There are lots of options available for trigger shapes and reach, manual safety levers, magazine release buttons, magazine wells, and more, so it’s not difficult to get a gun that’s perfect for you. The downside of a 2011 is that they tend to be pricey – $1500 or more. And that’s not including working magazines, which can run $125-150 each, and you’ll need at least three. Why did I say “working” magazines? Because 2011s can be notoriously finicky, and their magazines more so. It’s one of the downsides, though often worthwhile to put up with if you find you like how the gun shoots. However, you’ll likely have to order your gun from the gunsmith or shop directly building your gun, so you should be able to get help from an expert if you have any problems. 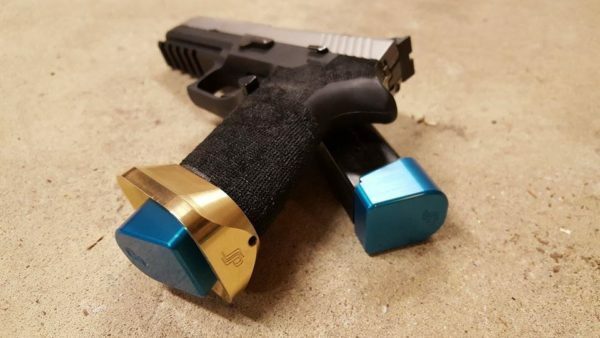 The other downside of the 2011 for 3-gun is that you may need to ground your gun in a bucket or on a table or reholster it, during certain stages. Besides the fact that you’re tossing your expensive investment down, you also must remember to re-engage the manual safety. Not doing so can be a disqualification. They can still be a great choice, though, and to find your own, you should talk to local competitors who have 2011s and ask who built their guns. What’s your take on going 2011? 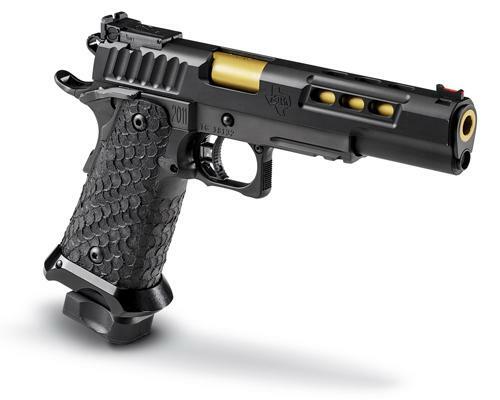 The other direction that makes sense is one of the popular competition-oriented striker-fired handguns like a Glock 34, Smith & Wesson Performance Center M&P, or SIG Sauer P320 X-Five (though maybe be careful with this last one for now, given some of the recent questions surrounding the P320). These models are recommended partially because their popularity makes it easier to find support and accessories. Exotic handguns can be difficult in competition when you can’t replace the sights to something easier to use quickly, or find extended magazines or basepads that will put you on equal footing with other competitors. But pick something like a Glock 34? You’ll have no trouble finding a holster and a gunsmith to improve the trigger or add stippling. Don’t make the mistake of thinking that something like a Smith & Wesson Performance Center M&P is just a basic off-the-shelf handgun. 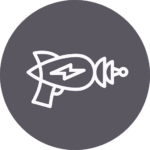 It incorporates features that have been requested by real competitive shooters, such as longer barrels than you might see in a duty or concealed carry gun, slide porting to improve recoil characteristics, improved sights, and an enhanced trigger. The SIG P320 X-Five is another excellent choice that ships with a magazine well already attached, as well as extended magazines. The X-Five, like other P320s, is currently part of the voluntary upgrade program but remains comparably safe to other competition guns and if you’re getting ready for next season, any problems with the model should be ironed out by then. One reason you might want to go with a Striker-fired gun is that they tend to be cheaper than 2011s, both for the gun itself and accessories. It’s already expensive to compete in 3-gun because of how many guns and how much gear you need, so being able to spend a little less here and still have a gun that is competitive on an equipment level can be a good thing for your budget. In addition, striker-fired guns aren’t required to have manual safeties. When you ground a striker-fired gun or reholster it on the clock, you only need to remember to do so in a safe direction and with your finger off the trigger to prevent a negligent discharge. That makes them somewhat simpler to deal with during a stage because it’s one less thing to remember. Regardless, you can’t go wrong with one of these choices. It all depends on how much you want to spend and what kinds of pistols you’re comfortable shooting. Unlike shotguns and rifles, which usually start in your hands, staged on a table or in a barrel, or carried on a sling, pistols need holsters. However, most ordinary holsters aren’t always the best idea for 3-gun. With all of the running around, as well as the opportunity for your pistol to get knocked around while it’s still in the holster, you want to make sure that your gun actually stays put until you’re ready to use it. This is especially important because a gun falling out of a holster can be a stage or match disqualification. To prevent that, it’s a really good idea to get a holster with a higher level of retention to hold the gun in. One approach is to get a holster that has very high sides and the ability to heavily tighten the friction fit. The sides will help keep the gun from catching on things, like your slung rifle or shotgun, and the very firm friction-based retention is intended to make it hard for the gun to accidentally get pulled out. 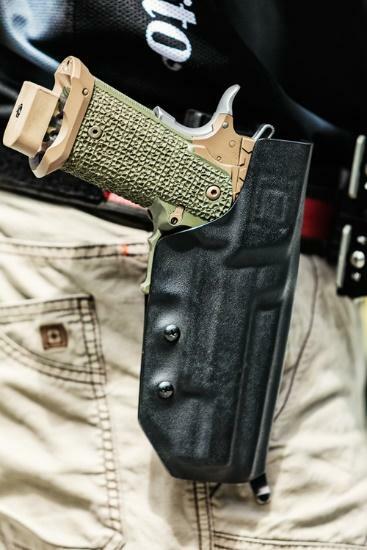 A friction fit holster is a great choice for 3-gun competitors. The other way to go is to use an active retention holster. 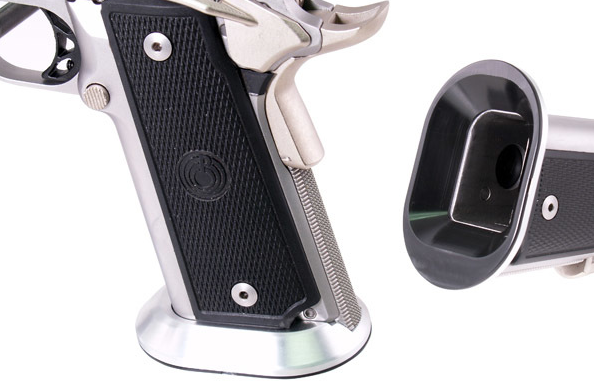 These add a strap or other type of physical lock that has to be disengaged by the user before the pistol can be drawn out of the holster, such as by pressing a button. 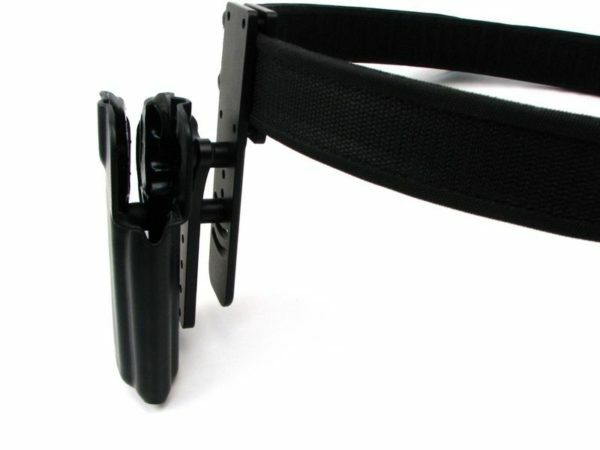 Either way, the holster should be attached to your belt as securely as possible. The holster coming off with the gun can be a disqualification – or at the very least, a bad day. The Ben Stoeger BOSS hanger is more commonly seen in USPSA, but works for 3-gun too. And now you’re all set up for 3-gun! We’ve talked about shotguns, rifles, and now pistols, not to mention other essential gear. It’s time to finish your shopping, get out to a match, and tell us all about it! My personal favorite is the Canik TP9SFX. I hope to be running 3 gun this summer (2019). I am new to the competition sports. Have patisipated in only 6 IDPA matches and my TP9SFX has worked very well for me. You might want to add the Walther Q5 match to your list again, for the price, is one of the best one! You might want to add the Walther Q5 match to your list. I badly wish I could get one in CA 🙁 I love Walthers. Do you know the brand of the first holster shown?